What is a BOGO Slap Chop? BOGO stands for Buy One Get One FREE. The BOGO Slap Chop offer comes with two Slap Chops, two Gratys, and a 3 year warranty. The BOGO Slap Chop offer is sold for $19.95 + $7.95 S&H for the first set, and an additional $7.95 to cover S&H for the second set. What is the difference between the standard Slap Chop order and the Deluxe Slap Chop order? Both the standard and the Deluxe Slap Chop orders are BOGO's - which include two Slap Chops and two Gratys. The difference is, the Deluxe Slap Chops comes with a Folding Cutting Board, and a third blade for the Graty - a slicing blade. 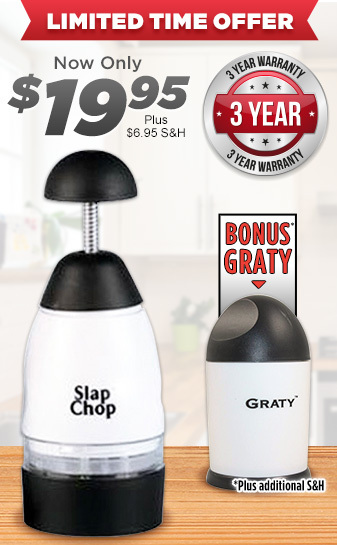 With the upgraded Deluxe order, you receive a limited 10 year warranty on the Slap Chop and the Graty as opposed to the standard limited 3 year warranty. The Deluxe Slap Chop is sold for an additional $9.95 + $3.95 S&H per set. Because you receive two sets with each order, the upgrade fee is applied to each set. You may view an invoice of your order at www.customerstatus.com. Please allow 24-48 hours for your order to be available in our system. How long do I have to wait before I receive my Slap Chops? Standard shipping, handling, and processing can take about 3 to 4 weeks from the date of order. Occasionally one's order will arrive sooner, but one should allow at least 3 weeks for the package to arrive. Priority is 1 to 2 weeks. How can I adjust my order? One may make adjustments to one's order by writing to: ronny@squareoneent.com or by calling 1-877-399-3491, 8:30AM-10PM, Monday - Friday EST. Please allow 24 hours for your order to be logged into our system to make changes. How do I chop vegetables like Vince? Please make sure that you start out with a small amount of food. Once you become more familiar with the product, you may gradually increase the amount of food chopped. Do not push the plunger top; slap or hit it. Make sure that when you slap the chopper, the blades go through the food. Allow the plunger to come all the way back up, which will give the blades a chance to rotate. Make sure the food splash guard is placed into the Slap Chop chamber correctly (don't place food guard upside down - see instructions). The Slap Chop will not work properly without this item in place. Food will not stick to the blades with the use of the food splash guard. When chopping an onion, remove the skin first. If you chose to leave the skin on, make sure that the onion skin is on the bottom.